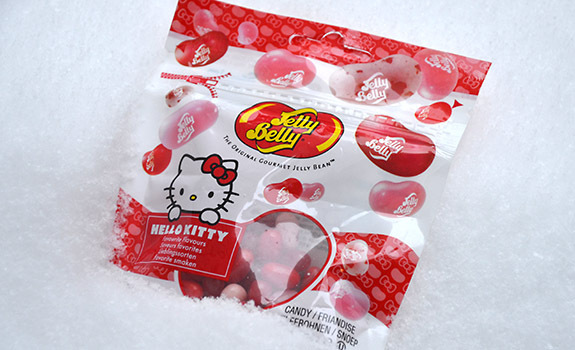 A bag of Jelly Belly Hello Kitty Favourite Flavours jelly beans, sitting in a May snowbank in Calgary. Because Calgary. Hello Kitty is adorable. Like anyone who isn’t a terrorist, miserable grump or talk-radio caller, I like cute, happy things. Smiles, rainbows, sunshine. The sorts of things a super villain would seek to ban if they took over the world. Which is obviously why I, like so many other people in the world, have a soft spot for Hello Kitty. This shared global appreciation is why that little cat is on every type of merchandise imaginable, from stickers to bed sheets to toys to stationery. Because of the massive marketing machine behind it, I wasn’t surprised to find a bag of Hello Kitty candy – jelly beans from Jelly Belly – in the London Drugs candy aisle. And of course I bought it. Because smiles and sunshine. Before I go any further, a note: these are not cat treats. Do not feed them to cats, be they Hello cats or otherwise. They are for people. People who like adorable kitties from Japan. The Pitch: “Hello Kitty favourite flavours.” There is no clear indication how a fictional cat can select favourite jelly bean flavours, but they are apparently as follows: bubble gum, cotton candy, red apple, sour cherry, strawberry cheesecake and very cherry. I like this curated approach to a bag of assorted Jelly Bellies, as it keeps the riffraff out – I’m looking at you, buttered popcorn. Also, gluten-free, gelatine-free and nut-free. The Taste: Because the colours are so similar, it’s hard to know exactly which flavour you’re going to get when you pop a bean in your mouth. Here’s the run-down. Red Apple: Juicy and apple-like. Not annoying. Surprisingly good. Strawberry Cheesecake: Creamy and almost coconut-like. More pina colada than cheesecake. Candy Floss: Like cotton candy, by way of buttery melon. Bubble Gum: Double Bubble that dissolves into banana notes. Reminds of me of an antibiotic medicine from my childhood. Sour Cherry / Very Cherry: Almost identical. One of them is more sour than the other, but they all kind of blur together. The sour one is sort of like cherry blasters, and the very cherry one is sort of like eating lip gloss. 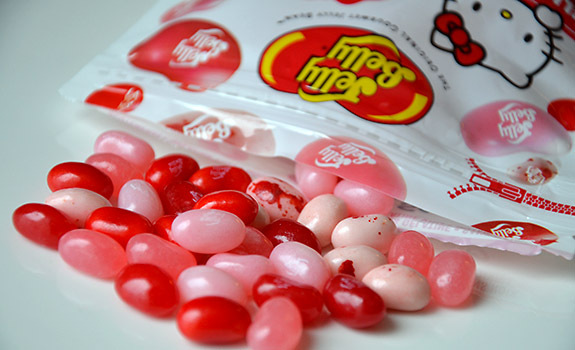 A scattered bunch of Jelly Belly Hello Kitty Favourite Flavours jelly beans. This Canadian bag of beans contains six flavours, not five. Cost: $2.49 for a 90 gram bag at London Drugs in Calgary. Nutrition? : Per 35 pieces (40 grams): 140 calories, 0 grams of fat, 5 mg of sodium, 0 grams of protein. Mystery: Five or six flavours? This bag states that there are six flavours, and it lists them as I have reviewed them above. But the Jelly Belly website only lists five flavours in the Hello Kitty blend. The missing flavour from the website? Sour Cherry. Also, the Candy Floss flavour has been renamed Cotton Candy. The verdict: Jelly Bellies are strange. If they were all as uniformly delicious as they are ambitious, they’d be the best candy in the world. This package has no downright bad flavours, which makes it a winner.